We’ll marvel one last time at Marvel Comics' real-life superhero, Stan Lee. John Romita Sr., worked on "The Amazing Spider-Man" comic with Stan Lee at Marvel in the 1960s. He would go on to become art director at Marvel. "I just wanted to say that, as a child, I really thank Stan Lee because he helped me. Reading the Hulk comic books — my dad was in Vietnam when I was born, and he came back with post-traumatic stress disorder, and it was really hard on my family. And I read those comic books and I can tell you, they made a huge difference in my life, because men and women that serve have some of the Hulk in them and kids need to relate to those books, and I did. I just wanted to say that I really, really appreciated his artistic ability and his contribution to me as a child dealing with my father. "It was the imperfection — the fact that you could have somebody that had [Dr. Robert Bruce] Banner, and have a side of scientist, and have a great mind, which my father did. He had a master's degree from the University of Alabama, very accomplished in the military. And he's passed now, but when he came back from the war — he was in the Gulf War and Vietnam — and he had a side of him that was a struggle, and that's what Stan captured for me as a child, is that it was OK to have that struggle. It kind of brought something I could understand and relate to as a kid, and I related it to my dad. He will be missed, and thanks to Marvel for bringing it to fruition." "In these words, we see history’s best-known comics creator in full spectrum. There is the inarguable fact of his genius for penning narration and dialogue, for conjuring words that could waltz, jitterbug, and tango. There is the fictional universe he co-created, a cornucopia of concepts that eventually reshaped the entire entertainment economy. And then, it gets complicated." Hollywood Reporter: "Stan Lee, Marvel Comics' Real-Life Superhero, Dies at 95" — "Stan Lee, the legendary writer, editor and publisher of Marvel Comics whose fantabulous but flawed creations made him a real-life superhero to comic book lovers everywhere, has died. He was 95. 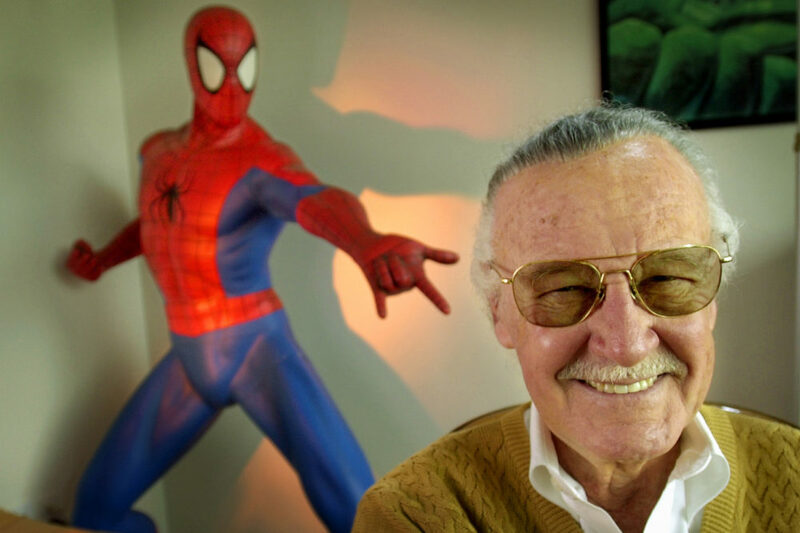 "Lee, who began in the business in 1939 and created or co-created Black Panther, Spider-Man, the X-Men, the Mighty Thor, Iron Man, the Fantastic Four, the Incredible Hulk, Daredevil and Ant-Man, among countless other characters, died early Monday morning at Cedars-Sinai Medical Center in Los Angeles, a family representative told The Hollywood Reporter." Vulture: "It's Stan Lee's Universe" — "People are almost always surprised when I tell them Stan Lee is 93. He doesn’t scan as a young man, exactly, but frozen in time a couple of decades younger than he is, embodying still the larger-than-life image he crafted for himself in the 1970s — silver hair, tinted shades, caterpillar mustache, jubilant grin, bouncing gait, antiquated Noo Yawk brogue. We envision him spreading his arms wide while describing the magic of superhero fiction, or giving a thumbs up while yelling his trademark non sequitur, Excelsior! He’s pop culture’s perpetually energetic 70-something grandpa, popping in for goofy cameos in movies about the Marvel Comics characters he co-created (well, he’s often just said 'created,' but we’ll get to that in a minute) in the 1960s. But even then, he was old enough to be his fans’ father — not a teenage boy-genius reimagining the comics world to suit the tastes of his peers but already a middle-aged man, and one who still looked down a bit on the form he was reinventing. "A comic-book Methuselah, Lee is also, to a great degree, the single most significant author of the pop-culture universe in which we all now live. This is a guy who, in a manic burst of imagination a half-century ago, helped bring into being The Amazing Spider-Man, The Avengers, The X-Men, The Incredible Hulk, and the dozens of other Marvel titles he so famously and consequentially penned at Marvel Comics in his axial epoch of 1961 to 1972. That world-shaking run revolutionized entertainment and the then-dying superhero-comics industry by introducing flawed, multidimensional, and relatably human heroes — many of whom have enjoyed cultural staying power beyond anything in contemporary fiction, to rival the most enduring icons of the movies (an industry they’ve since proceeded to almost entirely remake in their own image). And in revitalizing the comics business, Lee also reinvented its language: His rhythmic, vernacular approach to dialogue transformed superhero storytelling from a litany of bland declarations to a sensational symphony of jittery word-jazz — a language that spoke directly and fluidly to comics readers, enfolding them in a common ecstatic idiom that became the bedrock of what we think of now as 'fan culture.' Perhaps most important for today’s Hollywood, he crafted the concept of an intricate, interlinked 'shared universe,' in which characters from individually important franchises interact with and affect one another to form an immersive fictional tapestry — a blueprint from which Marvel built its cinematic empire, driving nearly every other studio to feverishly do the same. And which enabled comics to ascend from something like cultural bankruptcy to the coarse-sacred status they enjoy now, as American kitsch myth." Vox: "The darker side of Stan Lee’s legacy" — "Marvel legend Stan Lee died on Monday, at the age of 95. "Lee is considered the godfather of Marvel Comics, having helped to bring so many of its treasured characters to life, from Spider-Man to Iron Man to the Fantastic Four. But that’s not the full story of how the magnificent Marvel universe was built. "The popular refrain is that without Lee, Marvel’s superheroes would never have become such beloved fixtures of popular culture. But in the comic book industry there’s a more tempered version of that refrain: that Lee, for a long time, took most of the credit and usually left very little to spare for the co-creators, partners, and artists he worked with along the way. "In 2016, Vulture's Abraham Riesman spent months talking to several Marvel writers, editors, and creative minds about Lee's impact on the world of comic books, including whether he deserves as much credit as he often gets. The result was a complex and extensive piece that dug into Lee’s callous reputation within the comics industry, in part by pinpointing a specific fracture point between Lee and Jack Kirby, the great comic artist-writer and Lee’s working partner at Marvel." This program aired on November 15, 2018.